Oil Reserves to cover 200 years ahead, chears Chavez. Venezuela has overtaken Saudi Arabia as the world leader in oil reserves with certified deposits leaping to 297 billion barrels at the end of 2010, President Hugo Chavez's government said Saturday. Energy Minister Rafael Ramirez told Reuters that the new reserves, which pushed the total 41 percent higher than the previous year, were booked in the South American OPEC member's vast Orinoco extra heavy crude belt. A jubilant Chavez told parliament that Venezuela's reserves now surpassed those of Saudi Arabia. "We have enough for 200 years," the former soldier said in a speech in which he denied he was a dictator, complained that he was being unfairly "demonized" and offered to give up much-critisized decree power a year ahead of schedule. There are suggestions that countries, including Saudi Arabia and Venezuela, have exaggerated their oil reserves in the past, though the producers deny doing so. Some analysts point out that some Opec members' reserves figures have not changed in years, suggesting new discoveries had exactly matched output, while others say the lack of independent verification gave rise to doubts. OPEC said that Saudi Arabia's reserves stood at 265 billion barrels in 2009. Saudi Arabia's advantage is that its oil is mostly light, conventional, easily-pumped crude, while the Orinoco deposits are extra heavy tar-like sour crude that must be upgraded or mixed with a lighter grade to create an exportable blend. A year ago, the US Geological Survey reported that the Orinoco belt held some 513 billion barrels of crude that could be recovered — if costs were not an issue. Some experts say the area's geology means it is uncertain how much oil could actually be extracted — and that even with global prices currently climbing to close to $100 a barrel, exploiting most of it would be prohibitively expensive. 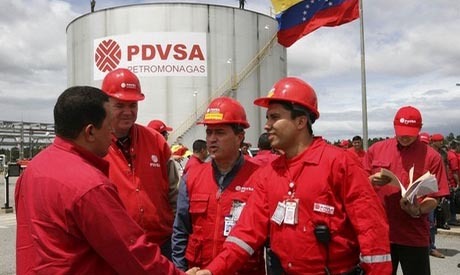 There are also doubts about when touted Orinoco projects will come online because of mismanagement in the state oil company PDVSA, which has a majority stake in each block, and uncertainty about investing in Venezuela, where Chavez has nationalized most of the oil industry. The technology needed to pump the Orinoco's ultra-heavy crude is much more complicated and expensive than the light oil machinery. But since analysts say the world's reserves of easy-to-produce light oil are running out, the future of the industry is in more difficult production areas like the Orinoco belt, Brazil's deep water fields or Canada's tar sands. Ramirez also told Reuters that the country's proven natural gas reserves had risen 5 percent in 2010 compared with the previous year to 195 trillion cubic feet. Chavez told parliament Venezuela now had the eighth largest proven gas reserves in the world, and that it would soon reach fifth place. @ Oilman, my Dad just joked about that! they probably have some terrorists there too... Let's rout 'em out! A new oil reserve to steal and horde. Bet they have WMD's! Better go find out..